A twist on classic football snack flavors. In a small bowl, combine Havarti, blue cheese and flour. In a small saucepan over medium heat, bring beer and half & half to a simmer. Add the cheese mixture, stirring until melted. Remove from heat and set aside. Cook the chicken fries according to package directions. In a medium bowl, combine the hot sauce, butter, cayenne and garlic powder. Toss the cooked chicken in the sauce, return to oven for 3-5 minutes. 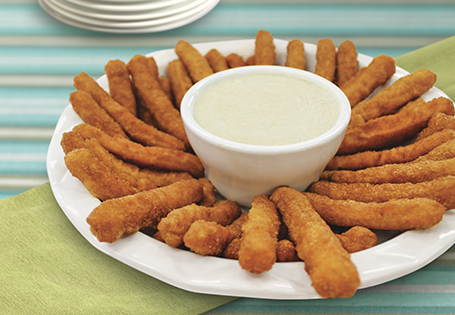 Serve chicken fries with blue cheesy dip.